Although this TARDIS right here might not be able to actually transport you through the delicate fabrics of time and space, it might be pretty well capable of serving you and your friends with the required amount of chilled ice whenever called for! 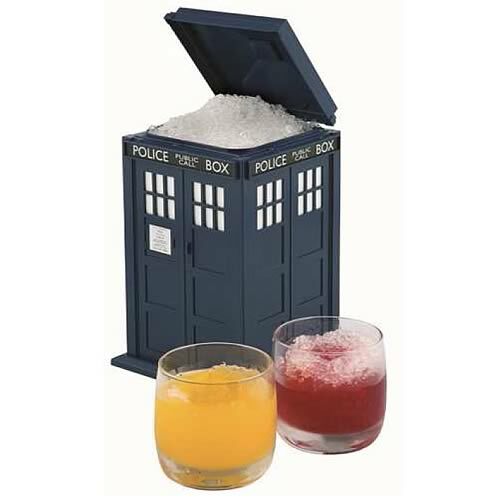 This cool TARDIS ice box is probably one of those things that can add that extra little geekiness to your parties and chill-out’s, just pop the hood and serve yourself with some geeky ice, freshly transported from the nearest refrigerator with some human aid. Selling for just $24.95, this is one geeky ice box you wouldn’t wanna miss out on! As all other ice boxes out there, this one comes with the state of the art thermal insulation just to ensure it remains cool and chilled out just as the partying guys. This cool TARDIS ice box along with your TARDIS Cookie Jar and the TARDIS Mug might make up a complete collection, and I just recalled, the cool TARDIS cake could just be the perfect way to celebrate your B’day!